below are the pics that were used during the discussion and a copy of the chat transcript, i have removed all the Hi's bye's time stamps and most of the off topic. post pics and links to the chat here. Wow, sounds like it was a good chat. I would have liked to join in. Too bad I'm at work! Great pictures. Martins link to blue II or III ? Interesting link arboreal stort of..
Post a picture of it please. 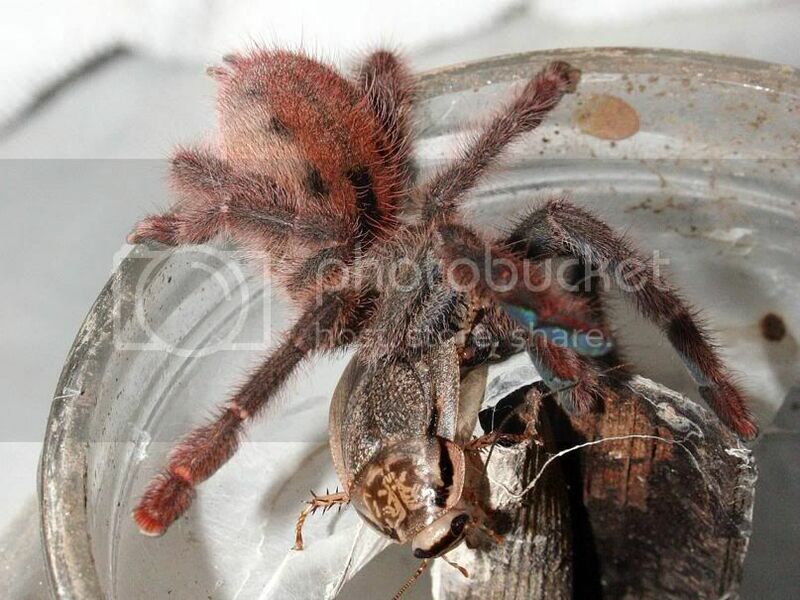 I was going to post links to pics of Avicularia sp "amazonica " here but i have deleted the email. I would just like to thank for tonights arboreal chat, well done and a great chat. I will post a transcript tomorrow for those that did not make it. Yes a great nights chat from and all who came in, normal partly OT chat is good but this gives chance to talk more about spids in depth and they will get even better as they go on im sure. Martin_H. : do you know which time is in the UK right now? Phalagorn: I think that UK are 1 our back in time. Martin_H. : ...when the chat will start at 8 pm, why is there nobody here right now? Phalagorn: brb, Im just cocking noodles! angelarachnid: Martin was it about this ornata sp "blue"? Phalagorn: And now, were do we start with P. ornata "blue"? angelarachnid: Ok lets start with ornata sp blue. angelarachnid: Possibly from the female Poco, but not something i would consider as "distinct"
angelarachnid: The taxonomical feature of the spot on the underside of the leg is stable, the size of the spot is not. Phalagorn: Martin_H. do you got P. sp "blue"? Phalagorn: angelarachnid - do you know how "light"? Ian_M: Phalagorn Thats the Q I was going to ask but not directed at Martin has anyone here got one ? angelarachnid: something like the size variation in relation to region in P. subfusca might be covered but that is about it. Phalagorn: Ian_M if he got I wonder how big? if it� ok? angelarachnid: where would we draw the line? 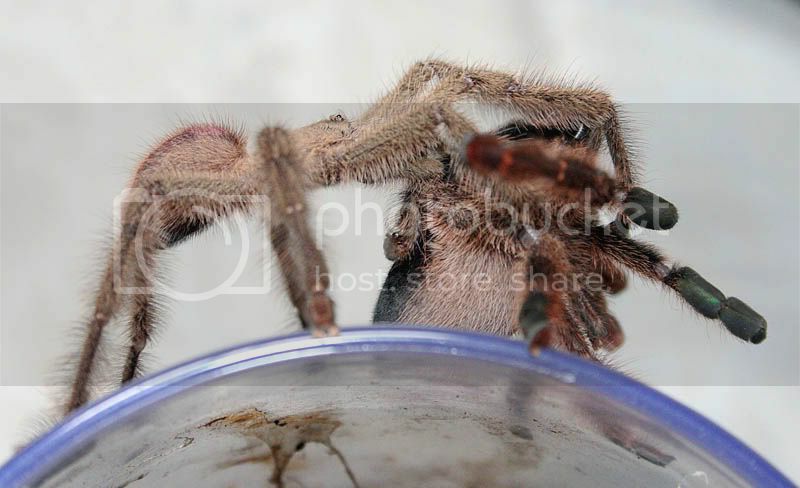 FryLock: mine are not "blue" i do have P.ornata sp "swindon"
angelarachnid: Is it an idea to also have a thread running on the forum to lost links and pics? angelarachnid: Ok give me a min i have to split screen the chat. 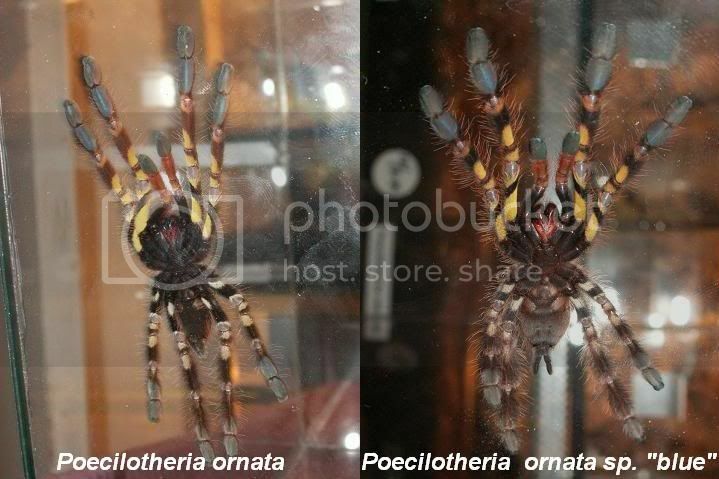 metallica: as they are sold as P. ornata sp "blue"(thus ornata and not a new species), and had ornata price, what is the problem? metallica: that was the blue regalis that has the high price tag. Phalagorn: angelarachnid - Does the link work? Phalagorn: it� an juvenile P. ornata "blue"
Phalagorn: ok, where is the thread? metallica: only 1 question.... where is the blue? Phil_messenger: did the ornata "blue" get introduced to the hobby from W/C? metallica: and only at certain times a day Bill? FryLock: someone risks exporting P.ornata from SL? MetalDragon_boy: what links are you talking about? Martin_H. : Fry, why risk? I know one who has export permits for Sri Lanka! angelarachnid: i dont sell them as spec "gold"
Martin_H. : Fry, it took him a lot time to get the papers, but he got them! Phalagorn: So what are you guy thinking of the little diffrence at femur? MetalDragon_boy: As far as i know I and Phalagorn is the only ones in the forum that keeps this ornata "blue"? MetalDragon_boy: yes as I said I and you stefan! metallica: anyone ordered the P. "tigris"yet? angelarachnid: no how much are they selling for? Martin_H. : eddy, who is offering them? Phalagorn: angelarachnid - do you got some pics and where? angelarachnid: Pics of which one Steffen? Martin_H. : Eddy, where? Haven't seen this ad! Phalagorn: angelarachnid - ornata with diffrent size of spot at femur? angelarachnid: ok back son i will see if i can find my pics. Phalagorn: but tigris isn�t a valid name! FryLock: was it not beeing named after HFW? Phalagorn: some one that have any ideas about ornata "blue"
FryLock: have you been able to compair it to normal P.ornata in anyother way then markings tho? MetalDragon_boy: mine is really small to, about 1"
Ian_M: so realy its a wait and see job with them ? paul: could they be hybridised with p.mett?? paul: was just a suggestion lol in what way would it be different if hibrid sp?? Phalagorn: angelarachnid - nothing but light form? how? Phalagorn: Martin_H. the link? origial ornata? freshly moult? paul: at what size do pokies get their striking colours on their legs? paul: spking of vental has any of you seen my post about ventral sexing? angelarachnid: Pete kirk has this also and still says they are ornata. Phalagorn: that the blue is light? Phalagorn: that the ones called "blue" it�s the "light form" but itls still ornata, Im i right? Phalagorn: angelarachnid : what about the sling,? you got one with big white spots at femut frpm normal ornata? petrospider: so you plan to go over there in a year already, Ray? metallica: bring me back some Phoneutria will you Ray? Tescos: any idea of genus or just a big spider report? metallica: when are you going Ray? Phalagorn: angelarachnid : may i use the pic of the light form of ornata to our swedish forum to explain about this ornata confusion? angelarachnid: anyone seen any of those "red" pokes? 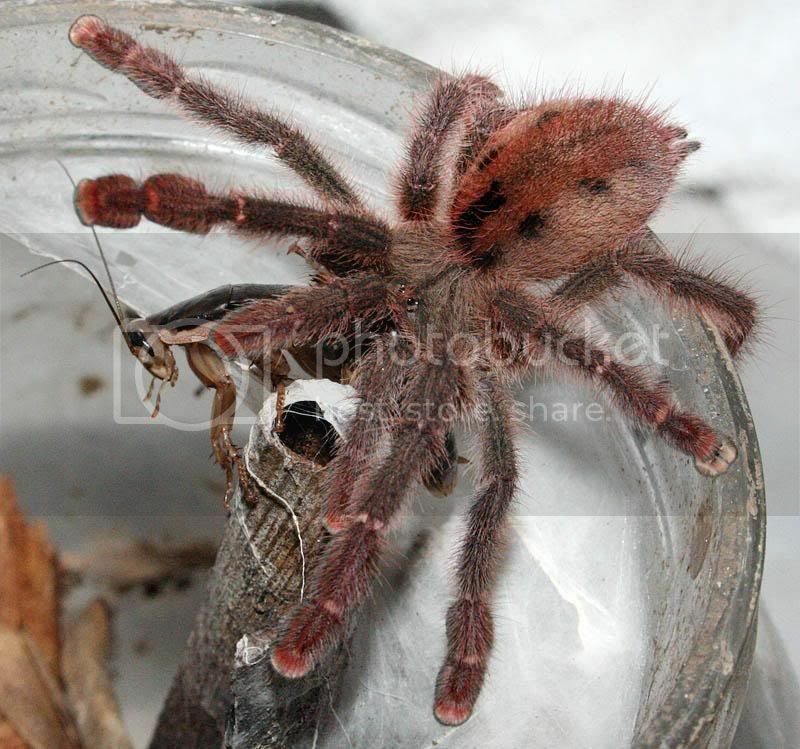 angelarachnid: the spiderlings should be moulting by now? paul: why do H.maculata slings/juves burrow when they are supposed to be aboreal? Ian_M: Now did anyone here buy any of them ? Phalagorn: speaking of "red" I got som e nice pics of Iridopelma sp. "Cear�"
Martin_H. 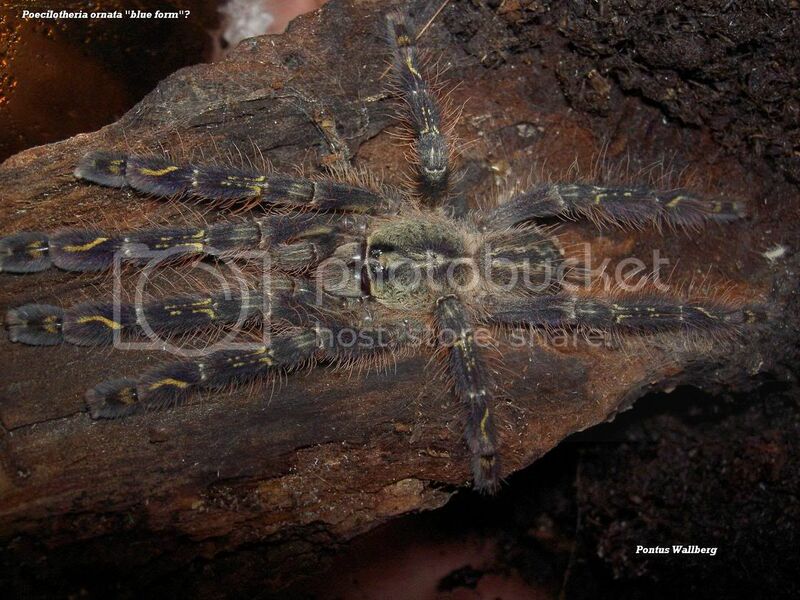 : ray, as far as I know, nobody has bought some slings of the Poecilotheria sp. "red"
the people might saw him selling the P. subfusca slings! Martin_H. : Chris, sure for the P. sp. "red" or maybe for the P. subfusca he had? Phalagorn: angelarachnid: I� l had post them now Iridopelma sp. "Cear�"
angelarachnid: are they any different to recife? paul: how do you tell if a t has been hybridised or not when there could be colour variations? 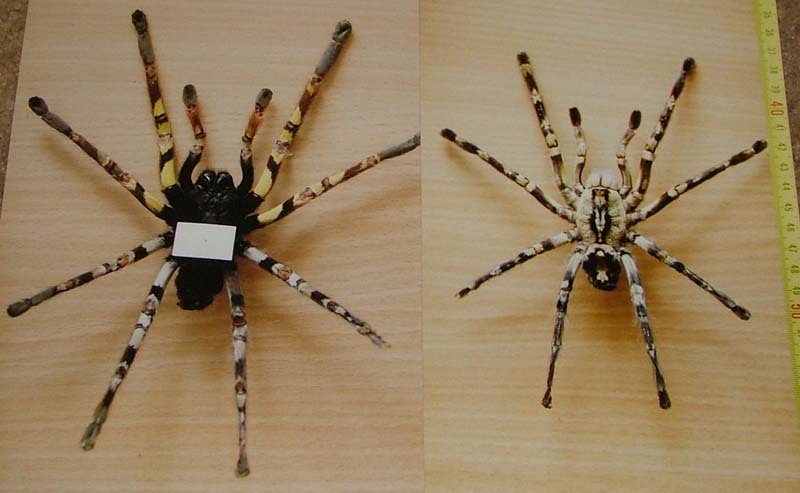 angelarachnid: has anyone bought specimens from Jeffe in the Philipines? II � bluer than C. sp. blue"? were possitively IDied as such? angelarachnid: is there any Pics Martin? metallica: anyone have the Cyrio blue with a dark carapace? same as the bigone @ BTS had? paul: would i be right in saying that a T has it's own pheremone and therefore a male could not get mixed up with another sp when looking for a mate ? angelarachnid: Martin do you know if Boris is around? FryLock: is that the T.gigas looking one ray? FryLock: very dark with some dark red hair? paul: how fast do they grow Ray? paul: is the T gigas the orange tree spider? 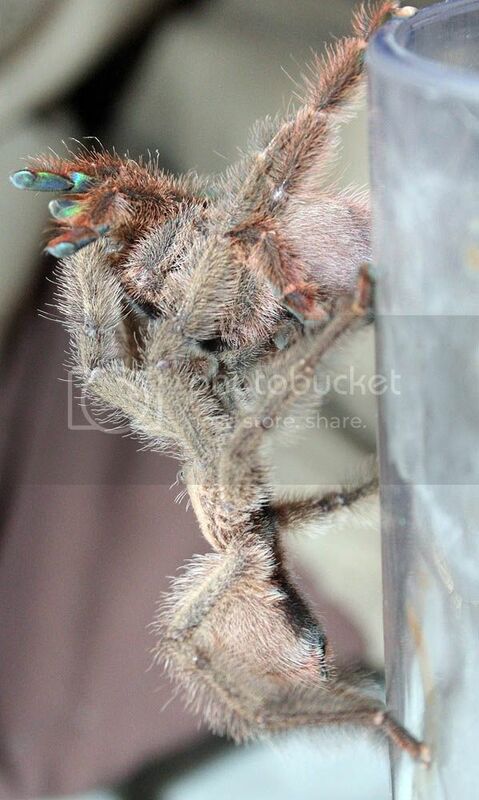 angelarachnid: anyone think they could be a sub genus of Avics? Phalagorn: angelarachnid : how its going with P. reg (siam folio) ? interested in taxononmy and Bertani told someting about the relation of Avicularia, Psalmopoeus, Tapinauchenius, etc. ... quite interesting. Tescos: to be fair though Bill its true in most cases isn't it? Phil_messenger: are you going to elaborate martin? angelarachnid: Paul did they make web? Martin_H. 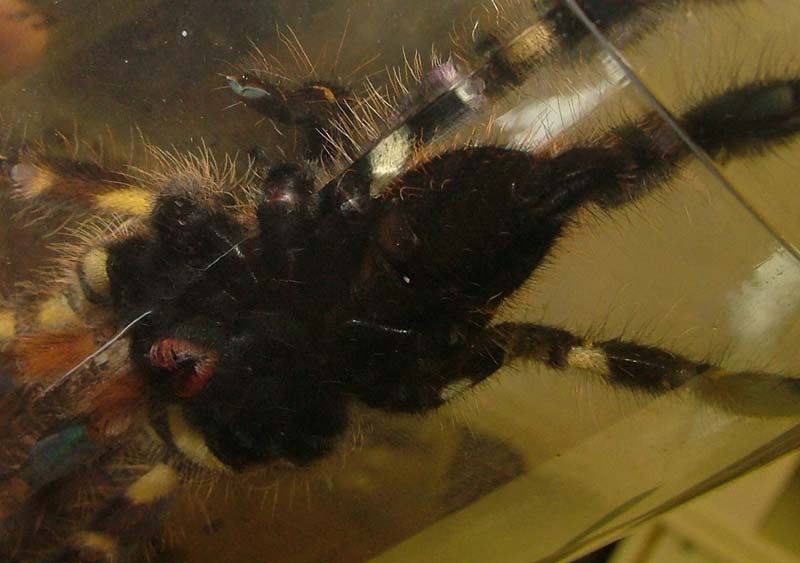 : talink about A. versicolor kicking U hairs see also: bertani, R., et al. (Araneae, Theraphosidae). Bull. Br. Arachnol. Soc. 12(9): 395-398. Tescos: you giving that one on the sunday ray? Tescos: Phil have you had any movement on the P.pulcher front? paul: can Richard Gallon get in chat yet anyone know? angelarachnid: I would be interested in a copy Martin if you have it. Phalagorn: My girlfriend is wondring of Avicularia amazonica, any one who know of it? Martin_H. : phalagorn, that is not a valid name! FryLock: what do they look like Ray? Martin_H. : Phalagorn, better use Avicularia sp. "amazonica"
angelarachnid: where can i get a copy of the arthropoda? Phalagorn: Martin_H. so, it�s not valid name? Martin_H. : PHalagorn, correct, Avicularia amazonica is NO valid name!!! angelarachnid: Just a thought, if Volker and/or Martin could send a small piece to the journals and websites saying where the copy of Arthropoda can be obtained with thier articles that should close that argument from Gunter? angelarachnid: OH i thought you cannot tell a book bu its cover? angelarachnid: So where in the trees are we going now? back to pokes, Avics or Taps? angelarachnid: and where is your better half tonight Ian? Phil_messenger: what arboreals do you expect to find in Panama? Sarah: will your next trip not be your last as a trip? Niko984: do you have any picture? angelarachnid: it should be called Avicularia sp "amazonica"
paul: have P.mettallica come down in price Ray? angelarachnid: I though it was Marc Baumgarten (now you see the Amazonica link) who was selling them? paul: how big are they for that price? Huk7: I assume this is your mets you're talking about ray? Huk7: excuse me, probably covering old ground here, but how are they doing? Huk7: regardless of outcome, a big congrats anyway, that was a result and a being a UK first, excellent! Huk7: lol, got hold of me though!! Chid: any one know of any subfusca going anywhere?? Chid: oh s##t , i'll go see a doc - i'm thinking like fry !!! Huk7: Ray, how long do regalis females take to mature on average then, from slings? Huk7: jesus! and is that trying power feeding, high temps etc, or just 'normal' conditions? Huk7: I'm going to buy shares in Custom Aquaria, if you keep on knocking Pokies out like that and all of the arboreal tanks needed!! Huk7: I saw that on that TV program and the numbers were huge!! Phil_messenger: any more arboreal chat / comments? Huk7: when you use the incubator, do you find you get a condensation build up on the walls of the holding tank or not? FryLock: what do pokes taste like vs Haplopelma? Huk7: in your experience, did you find the specimens easy to find though? Phil_messenger: what site are you looking at? FryLock: all live at farely high alt Sericopelma right Ray? FryLock: ever seen the one that looks a lot like B.vagans? angelarachnid: what is that blue thing? FryLock: you think he he missed the apop? angelarachnid: didnt see the apaop but they are too "black"
angelarachnid: well what you think of the first discussion night? angelarachnid: do you think it will be something that might catch on? angelarachnid: phil what didyou think of the night? FryLock: haha what are they? angelarachnid: night all and thanks for comming in. sorry I have to dash off last nigth but I had stuff to do. Why is it that every time somebody goes and finds a spider in the wild, it's automatically a "new undescribed species" Either they know sweet-FA or huge amounts of unpublished taxonomic information (99% of the time it's the first option ). thx for the logs - i wasnt out of time at friday, so good to read the Logs.